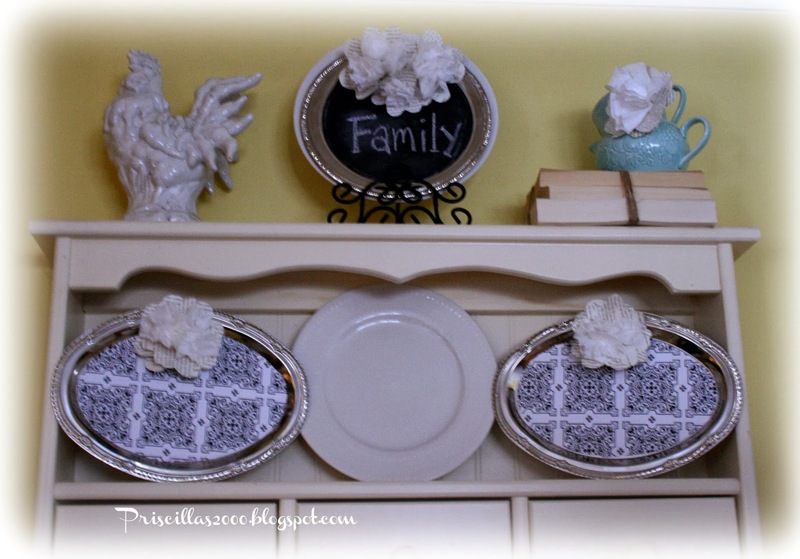 Priscillas: Family Silver Trays With Book-Page Flowers and a Giveaway! 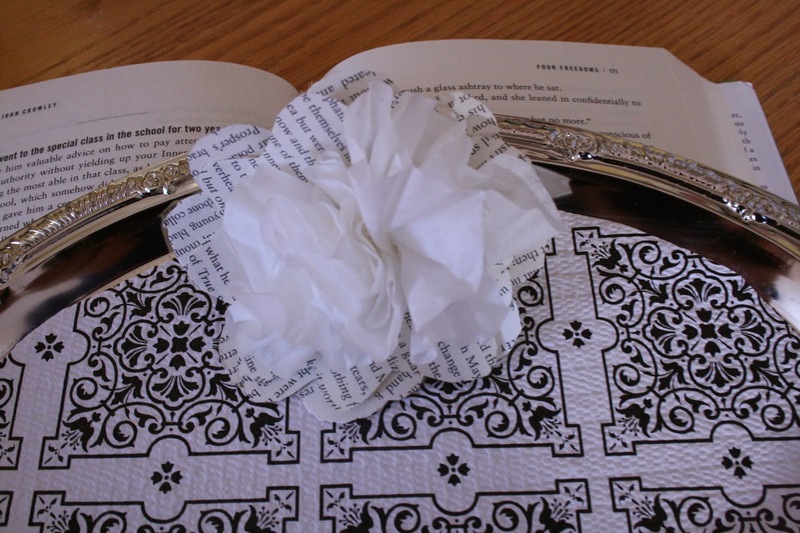 Family Silver Trays With Book-Page Flowers and a Giveaway! Good Morning! I am so excited for this project! I am here to share my version of the Dollar Tree Value Seekers Club Platter Wall Hangings. Silver trays are such the rage right now, as are chalkboards and crafts made with book pages! So exciting that you can get these beauties for $1.00! Click on over to see the Dollar Tree version, and get your supply list. I used 3 trays …2 oval and one round. 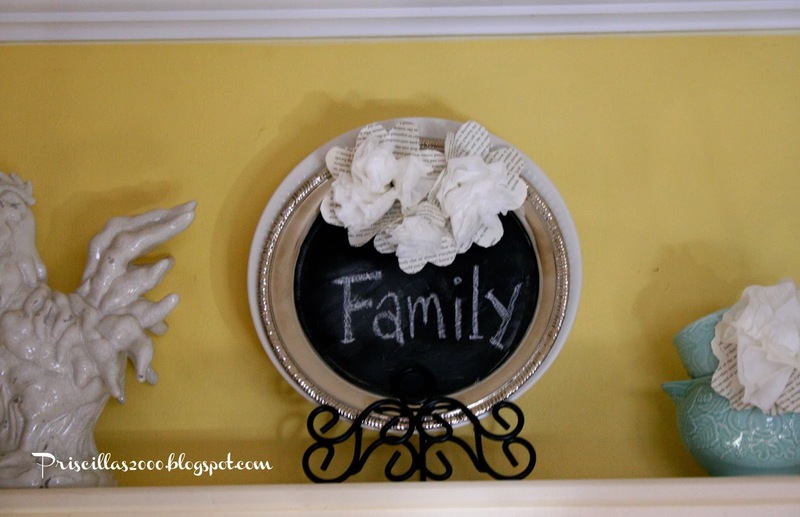 I painted the back of the round tray with chalkboard paint, it takes at least 2 coats to cover… When it dried I added the Family saying with chalk. I used the vinyl shelf paper with white glue to attach it to the oval trays. To make the flowers you need pages from a book and coffee filters, both are available at Dollar Tree. I used 3 coffee filters for each flower and 2 book page flower cutouts. Fold each filter in half then in half again... and bundle all three folded filters. Cut an x in the center of the book page flowers and insert the end of the coffee filter bundles. Hot glue together, then hot glue to the platter. I used 3 flowers for the round chalkboard tray and one flower on each of the oval trays. I used the silver trays on the wall shelf in my kitchen. It needed some new life after the Christmas decorations came down! Now for the giveaway! I am giving away a $100.00 Dollar Tree Gift Card to one lucky reader! Go sign up for the Value Seekers Club (it’s free and has lots of great ideas), then come back and leave me a comment of what project you would like to try and of course your email so I can contact you! The entries will stay open until January 19,2014. I will draw a winner on January 20, 2014 and notify the winner via email. Thanks so much for stopping by and good luck on the giveaway! I have been compensated for this post, but all opinions expressed are my own. I'd love to try their snow globe project. LOVE the silver tray project!!!! Thank-you for your wonderful blog. I don't know how in the heck you do it. But I did go and sign up cuz I'd be crazy not to want that giveaway. I liked this fortune cooking idea. Someone had a tip for happy, motivating comments to be put into a jar at work & I think that'd be a great way to display them. Nice of you to do this. This is such a smart money saving DIY and it is so cute! I just signed up and had no idea they had all of these ideas. One thing that my mom and I love to do is have themed parties so I love the Paper Fortune Cookie Favors! I just signed up. What a great idea. I love them all. I think I would like to try the food ones. Just got back from Dollar Tree. Then I got a text about the motion sensors. Anyway, I think the decorative clothespins are my best option at this point. Thanks for the chance to win. Just signed up...didn't even know about it...I LOVE THE Dollar Tree!!! Neat! I love your flowers :-) I just signed up for the Value Seekers Club. I want/need to make the Magnetic Clothespin Organizers. My email for the giveaway is bookworm187@earthlink.net. Thanks for sharing and hosting the giveaway! You are just a crafting wonder! I like the cracked ice vases. I just signed up so put me down for the give-a-way. I wold like to get the silver trays and paint them black and white like the MCkinzey Childs style. I shop our local Dollar Tree and signed up today. I just signed up. Thank you for all of your great info! I signed up! 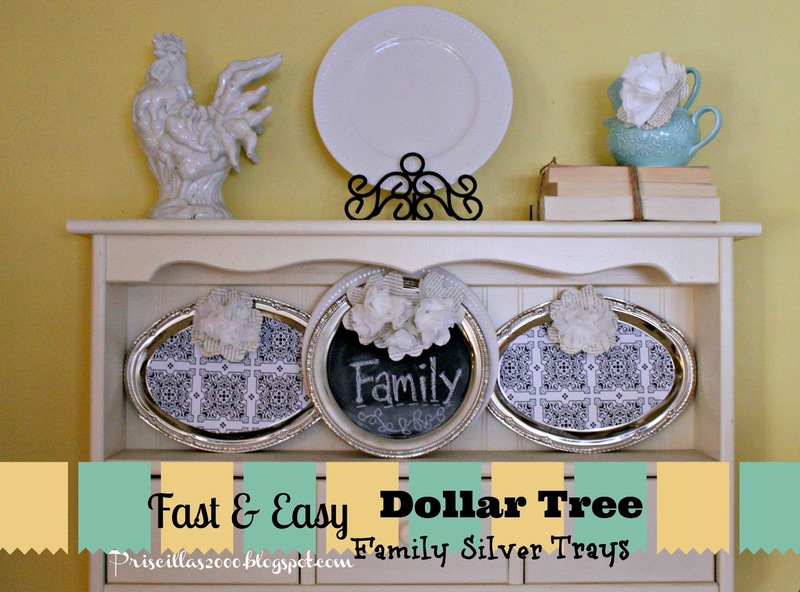 Planning to stop at my local Dollar Tree on the way home for some of those silver trays! My email is dorblain@comcast.net! I signed up and I would like to try the Paper Fortune Cookie Favors project. I signed up, and I would really like to make the winter ice vase project. I'm already signed up. I would like to try the silver tray project! Love your projects, Priscilla, especially because they look so great with little cost! The decorated painted rocks were surprisingly pretty. Prettiest rocks I've ever seen! I would like to try the rainbow cake, and the football part. I want to make the Mocha Raspberry Pretzelwiches. I am much not into crafts, but I am into eating delicious desserts. I will leave the craft projects for the kids. Love Dollar Tree! Just signed up. I'll be making the clothespins for the fridge. Would put a gift card to good use. Just signed up hrjohnson77@gmail.com. I want to try the cracked ice vases. i love the chili bar idea! perfect for super bowl! I am loving the crackled ice vases. I love the cracked ice vases. i like the frozen balloon drink coolers! I want to make the snow globe project. I would like to try the Magnetic Clothespin Organizers. I signed up! I would like to try the chili cart party for game day! I'm already signed up! I would love to try the crackled ice vase! I would like to try the platter wall hangings. Hi Priscilla, just signed up. What a great give away! I love the cracked ice vases. I want to try the glitter clothespins! I signed up and I think I am going to make the clothespin magnetic holders. I am trying to be more organized this year. I'm actually already signed up! :) The crackled ice vases would be pretty awesome to do! I am signed up and i like the winter ice vase project! I signed up and I would like to make the Magnetic Clothespin Organizers. I would definitely want to try using some of the serving trays for various projects. 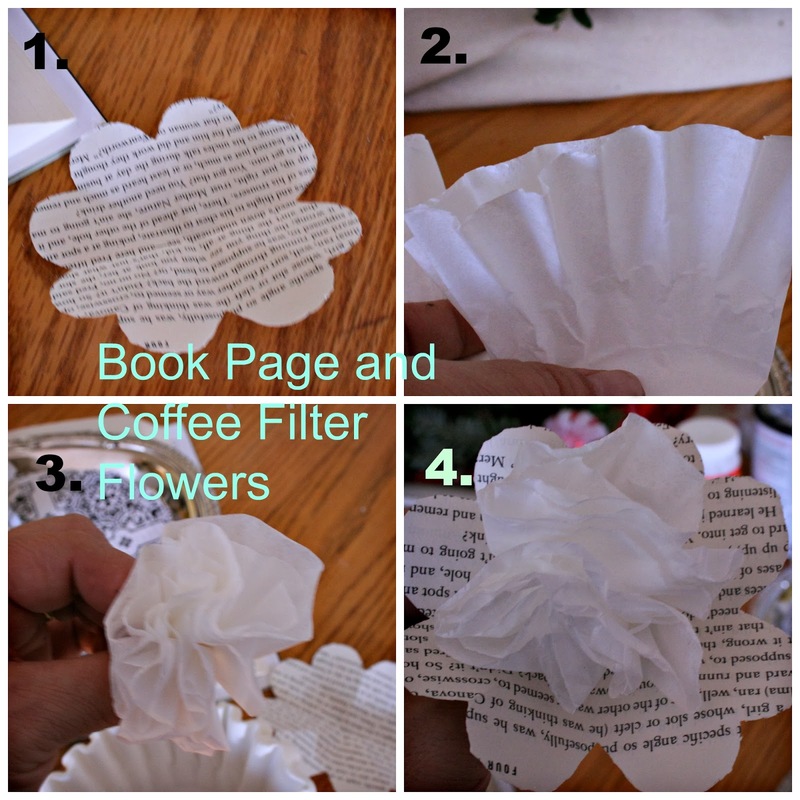 I really like how you used them with the coffee filter-book page flowers. i signed up daniellex at gmail dot com - i like their critter feet sock ideas! and the chili bar! I would like to try the chocolate overload brownies! I like the owl painted rocks and the tie-dye cake! I signed up!! Love the wall platter hangers! I'd try the Magnetic Clothespin Organizers! I love the baby shower ideas! Our 3 little ones and I are excited to try Critter Feet!! We are going to do skunks, bears, and fins.. just some of our ideas so far :) lol I also would love to try the Tye-Dye Cake!! Thank you so much for the chance!